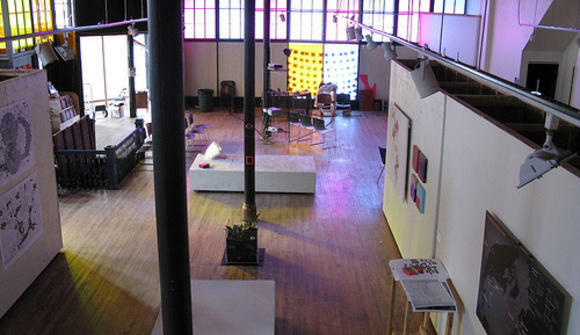 The Co-Prosperity Sphere (C-PS) is an experimental cultural center located in Bridgeport, The Community of the Future. The Sphere is a public platform for art and ideas and is an advocate for emerging art in all its forms. We produce exhibitions, socially engaged projects, critical publications and community initiatives. The C-PS hosts exhibitions, screenings, presentations, installations, festivals, meetings, classes and performance programs in its 5,000+ square foot complex. From our space we build independent cultural infrastructures to maintain a healthy art ecology for Chicago and our region. The C-PS contains the offices of the Public Media Institute; our parent .org that is a 501 (c)3 non profit arts organization. PMI helps produce the annual Version Festival and Select Media Festival; the art magazines Proximity, Pr, Matériel and the (Con)Temporary Art Guide Chicago. C-PS is also the home of Lumpen magazine and the newsletter The Bridgeport International. C-PS contains a few artist studios, as well as an international artist residency program. We also help facilitate two satellite spaces: Eastern Expansion, and Northern Exposure. Over 2600 square feet of gallery space outfitted with track lighting, maple floors and 15 ft high tin ceilings. Our large open rectangular space also features three 12′ X 9′ x 3′ movable walls that allow you to reconfigure the room. The double doors opening to the street offer convenient unloading of items from vehicles. Parking is available on the street. 30 chairs, two 6’ x 2.5’ tables and wireless internet access. We rent audio visual equipment; including two microphones, a video projector with 84” wide projection area, speakers with soundboard. Renters may work with any catering company­. We have a prep area and small kitchen. Renters need to provide their own utensils, ice and any other catering supplies. Co-Prosperity Sphere offers a list of caterers and the locations of local stores for event supplies, alcohol and food. Renters are responsible for procuring all permits required for a catered event. The renter must present to Co-Prosperity staff a catering permit and/or liquor permit by one week before a catered event’s date. Every event must have one Co-Prosperity staff member present, at a rate of $20 per hour from start to finish. Staff is not responsible for cleaning up. The renting party is responsible for cleaning up after the event and have all trash bagged and removed. If the room is not adequately cleaned, an additional fee will be charged depending on the condition of the space. ­Additional rules apply for those using the space for exhibition. Weekday evenings between 4 and 11 pm; weekends between 11 am and 12 midnight.